That famous line from Field of Dreams – “Build it and they will come” is the best way to describe our experience at the 2014 NCSL. NAIA took the plunge and purchased a booth display that was without a doubt one of the most attractive in the Exhibit Hall. The bright colors, the logo front and center and the message all worked together to draw people in. Of course, George Washington was strategically placed and people were forced to stop to admire. This allowed us the opportunity to explain that George was the originator of the American Foxhound which he needed to pursue his hunting adventures. The Legislators from Virginia were especially intrigued and one even took my card and asked if we could help him promote the American Foxhound which is the official dog of Virginia! It was somewhat amusing to watch the reactions of our visitors when they realized that NAIA was not affiliated with HSUS or any of the other radical fundraising groups. Once we explained that NAIA was the “reasonable alternative to the extremists,” the Legislators and staff members breathed a visible sigh of relief, relaxed, and said they were excited to know we were available to assist them. One staff member, who is the Research Director for his state’s Ag & Natural Resources Committee, asked if we could come and testify before the committee on animal issues! All those that we were able to engage in conversation eagerly accepted our literature. A Senator from Mississippi returned the next day to tell us that he had read our material and was going to check with his staff to see if he was available to attend our conference. A behavioral researcher also returned the next day to say how much she learned from our handouts, delighted that we were a research based group and that she was also considering attending our conference. Our visitors weren’t just Legislators and staff. We had other exhibitors come by as well. Two women were quite upset when they realized that the tote bag they were carrying with the elephant on it was from Ringling Bros. until we explained to them the facts about Feld’s conservation efforts on behalf of the Asian Elephants. They thanked us and left with a different opinion. The biggest reaction was to our handout about the unregulated importation of stray dogs. 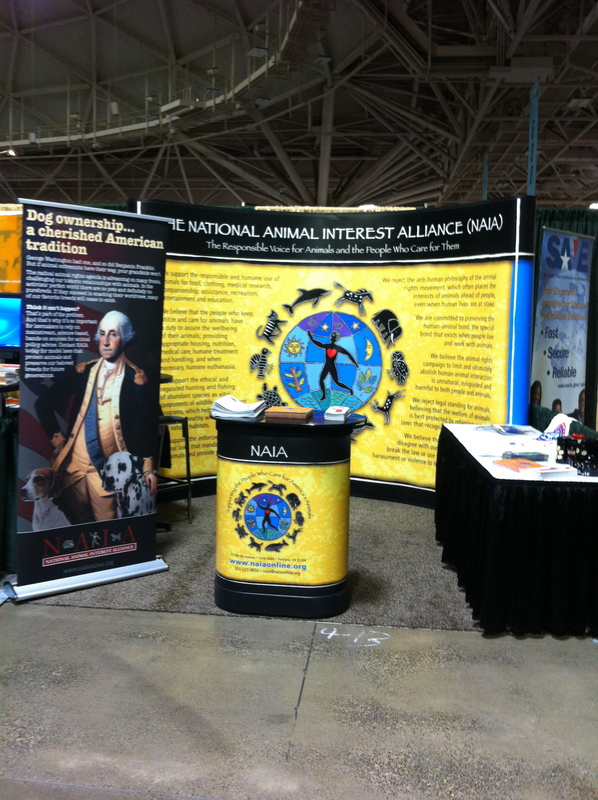 Nearly every visitor was impressed to learn the key roles NAIA plays with state and federal agencies in developing regulations to protect people and pets. Granted not everyone was thrilled we were there. One woman passed by and in response to Caren’s greeting said she didn’t know about NAIA, but, she didn’t agree with us. Can’t win them all! The most amusing encounter occurred Thursday afternoon when the MN Director of HSUS stopped by. He stood just outside the booth, read our values statement and snickered. He then proceeded to verbally assault me with his ranting about anti-trapping of Bobcats in MN. I explained to him that trapping was not my area of expertise and I wasn’t interested in standing there debating with him. He proclaimed that we weren’t interested in facts. I responded that we were indeed interested in facts, just not emotional rhetoric. After a second invitation, he left. 2015 NCSL will be in Seattle. Having a booth at these types of events is extremely important so that we can provide Legislators and others with an alternative perspective on the issues. They want to hear from us and NAIA needs to consider expanding its presence at other venues in order to spread our message.